2012 chestnut mare. ApHC number 672150. Dita joined our herd in another "meant to be" moment. I was up late one night, looking at Facebook posts, when I saw a post from the local horse auction, advertising an Appaloosa mare that was going to be sold there the next night. Even in winter coat the mare's quality was obvious - so I went to the sale & bought her. I was pleasantly surprised to find out her registration papers were with her & they were in proper order for transfer. As soon as I saw her papers, I knew her quality was not a fluke, as she was bred by Baker's Hydaway Farm in Hickory, PA. The Bakers are long time breeders of excellent horses. Dita also has a large percentage of foundation Appaloosas in her pedigree, another bonus!! Dita has very nice movement to complement her conformation & temperament, however, not much has been done with her for training under saddle. She will be trained this winter & once she has a solid foundation we will see what discipline she prefers as a show horse. 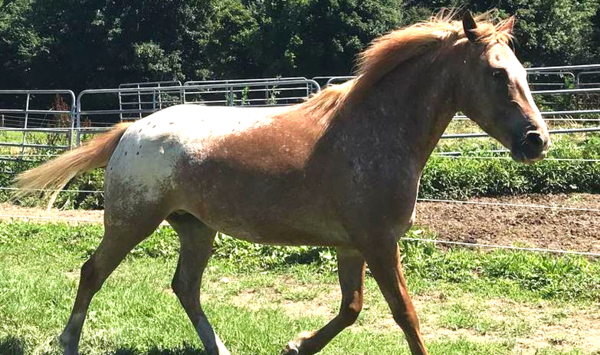 In the future she will be used as a broodmare for purebred Appaloosa foals & Ice-aloosa foals.